There are a number of supply and demand side indicators useful for analyzing the SMS market. On the supply side, the International Telecommunication Union (ITU) has identified the number of SMS sent as a relevant indicator to collect. The definition is provided in the ITU's Handbook for the Collection of Administrative Data on Telecommunications/ICT. The key point is that the definition refers to SMS "sent from mobile handsets to other mobile handsets (peer-to-peer), both to national and international destinations." The data are supposed to exclude "SMS received, value-added SMS, premium SMS and SMS sent from web-based services." In practice a number of countries do not strictly adhere to this definition, hampering comparability. 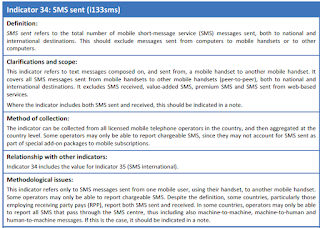 Countries where receiving party pays (RPP) has been the norm (i.e., operators charge users for both outgoing and incoming calls and texts) typically report both messages sent and received. This is the case for example for Canada, the United States and Singapore. The number of messages sent should roughly match the number received so the figure could be divided by two. There might be an imbalance between international SMS sent and received but in practice, overseas SMS accounts for only a small portion of the total. What is a bigger issue is whether the total traffic represents an accounting or technical measure. If it is an accounting measure, then the received text messages sent within a network (on-net) might not be included since the operator receives no payment for them. In that case, dividing the total traffic by two would underrepresent the sent messages. Most SMS messages are to and from mobile subscribers. 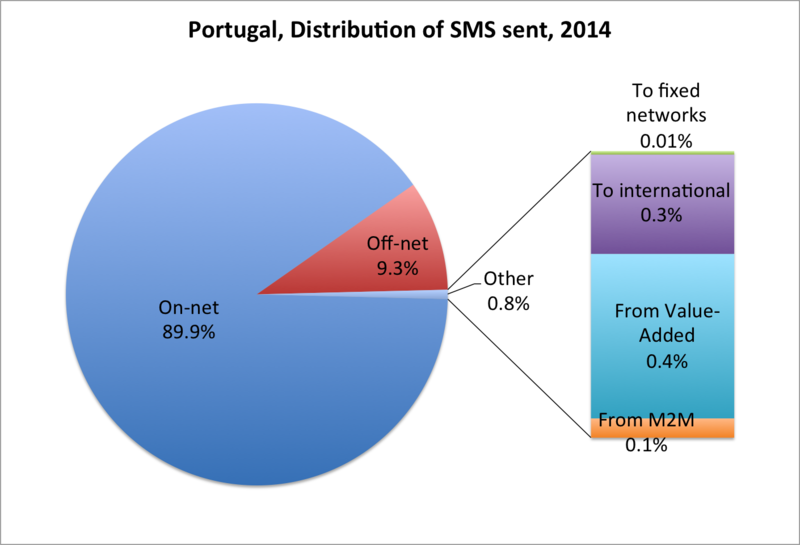 Take Portugal where 99.2% of text messages are between domestic mobile subscribers with international, Value-Added, Machine to Machine (M2M) and the fixed network accounting for a small proportion. 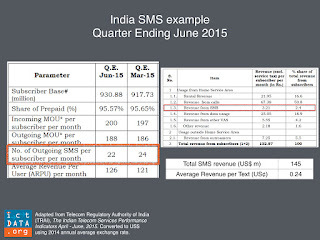 Most countries use a technical rather than accounting measure to record SMS traffic. This is because text messages can be bundled into a plan. The technical measurement ensures that all bundled SMS are recorded. Some countries use other methods. For example in Turkey, text messages were counted upon their arrival at the message switching center. However this resulted in text messages in Turkish being counted as more than one message. From 2014, messages were counted according to billing. As a result, SMS traffic dropped 18.2% in the first quarter of 2014 (compared to a drop of 5.7% the previous quarter and -7.2% the subsequent quarter). The number of text messages sent per mobile subscriber per month can be calculated by dividing the number of text messages by the average number of subscribers (see this post for the top 10 in 2014). Another ITU indicator is messaging revenue. Here the definition includes both SMS and MMS. MMS accounts for just a small proportion of total text so it is not a major issue that the revenue streams are combined. What is problematic is that it is becoming increasingly difficult to account for messaging revenue due to growing bundling of voice, message and text services. The revenue data allow the Average Revenue Per Text to be calculated. This is calculated for India where the underlying data is published by the Telecom Regulatory Authority of India (India). In the 2nd quarter of 2015, ARPT was 0.24 US¢. 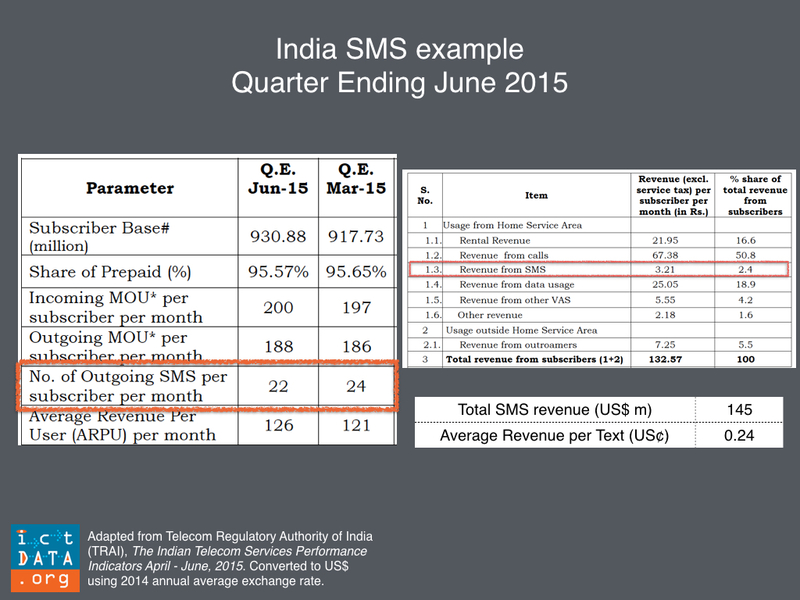 SMS accounted for 2.4% of mobile revenues in India during that period. 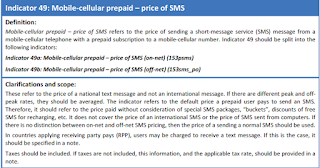 Other pricing indicators include the actual tariff for an SMS. 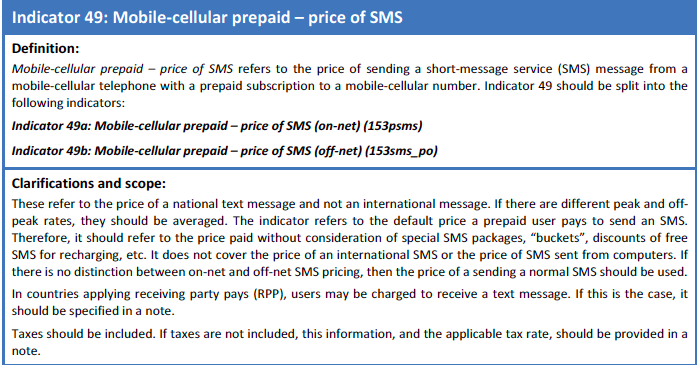 Here the ITU asks for the prices of an on-net and off-net pay as you go SMS. Prices for some African nations are shown in this post. 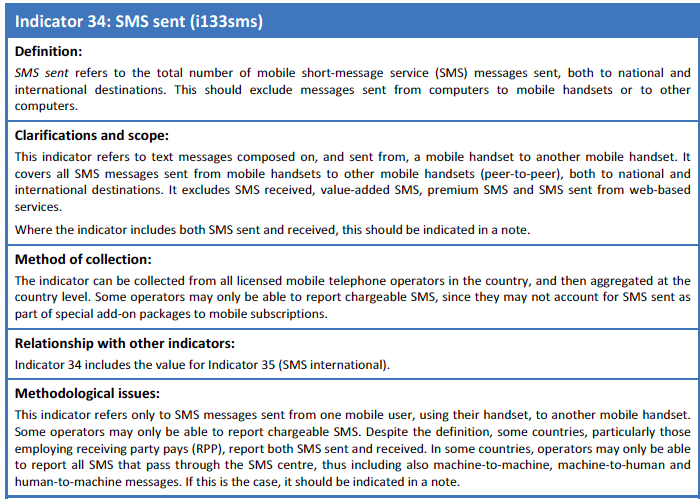 The SMS Termination Rate (STR) is the amount that one operator charges another to deliver a cross network message. In some countries, Sender Keeps All (SKA) is used whereby operators keep all of the revenue from and do not charge for delivering cross network texts. Other countries have STRs that are either agreed amongst operators or established by the regulator. The Body of European Regulators for Electronic Communications (BEREC) publishes STRs for their region (see this post). On the demand side, the percentage of mobile users who send a text message reflects the popularity of the service. A few countries compile this. The Pew Research Center has compiled data on SMS users in a number of countries with the proportion of mobile users sending text ranging from 98% in the Philippines to just 37% in Pakistan. This indicator is useful for gauging demand and analyzing why SMS usage is so much more popular in some countries than others (e.g., pricing, literacy, etc. ).The intensity of usage can also be obtained from surveys. For example in France, texters are asked how many they send a week (101 in 2014, see post).